Companies that have been hindered by first-generation content management solutions or the lack of a content management system at all, are now looking for a next-generation solution that enables truly exceptional, results-driven Web experiences. 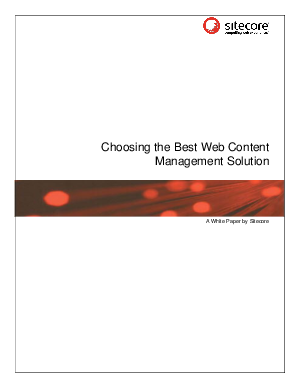 With the myriad different solutions for Web content management (WCM) available, it can be difficult to select the best one for an organization's needs. As many companies have now learned, getting the WCM decision wrong can result in a mediocre site delivering results that are below expectations. In the end, the best WCM is the one that is right for a particular organization's needs today and tomorrow. This guide offers insight into the WCM technology choices available today, discusses some of the requirements both IT and business users should consider when selecting a WCM solution, and includes advice for ensuring a successful evaluation process.